Risham Syed, Indians Viewing the Landscape, 2010, mixed media, dimensions variable. In her first solo exhibition in the United States, Lahore, Pakistan–based Risham Syed presents a striking landscape of Victoriana and contemporary violence. Comprising a series of paintings set into theatrical installations and unusual hangings, “and the rest is history” is a rich consideration of how colonial history and values inform and contradict Pakistan’s experiences today. Take, for example, The Marble Hearth, 2010, in which an antique-inspired fireplace is lit by a painting of flames shooting from the engines of a shuttle midlaunch, or The Cushion, 2010, a methodical salon-style installation of embellished frames, art-historical allusions, and needlework pieces balanced by a single image of smoke rising from an explosion that hangs off to the side, too high to view up close. Other works more subtly engage the layered ironies of Lahore’s British past. 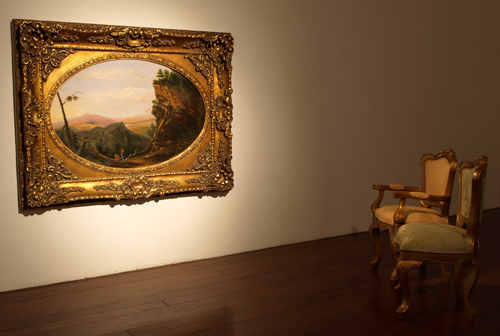 Among these is Indians Viewing the Landscape, 2010, a modified rendition of Thomas Cole’s eponymous nineteenth-century painting of two Native Americans looking out at an idyllic pastoral setting. The work hovers just above the floor, at the “eye level” of two ornate miniature chairs satirically completing the installation. Engaging the Hudson River School through British-born Cole and displaying the work in New York also suggests something of the complex relations among America, Britain, and its colonies in the period. Syed’s exploration of these topics aptly calls attention to the less studied relationship between Victorian history and South Asian Muslim cultures, and offers a lens into complex issues of both past and present in contemporary Pakistan.